Jo S: I've refused to have my head turned by too many new starts this week, although there were a good few that I had considered, settling instead on a 50% DC blend for a compact little pull-list. One of those DC offerings is an issue #1 though: I'm giving ensemble book Heroes In Crisis a go. The sample art from Clay Mann looks glorious and although I'm cagey about DC team ups, Tom King can do no wrong at the moment - even his off-days are best-days-ever right now - and Wonder Woman will always raise the appeal of a book for me. The mighty Doomsday Clock strikes seven this week - I wish hard that these were appearing closer together but I guess I'll be wishing they lasted longer when we reach issue #12! I'm in the habit of going back and reading the previous issue just before the next though, to refresh my memory of the increasingly braided storylines and to pick up more juicy little morsels of detail. Scarlet #2 rounds up my DC demi-list: I picked up a copy of the trade for the earlier Scarlet series on a recent foray to that London to get myself all caught up, so might try and read some of that at least before Wednesday. Image’s new otherworldly mystery Cold Spots garnered some tentative interest at the PCG meet last month, giving little away but layering intriguing storytelling with misty ghostly art and, with similarly spooky tones, Bone Parish has me gripped; a smartly written tale of drug-funded family business and politics. My final pick for this week is Beyonders #2 - the puzzle-geek hiding very close to the surface within me is sharpening her pencils and limbering up the guessing engine in preparation. James R: This week's pull-list reflects the resurgence of DC this year for me. After a good five or six years where they seemed to lose their way, it's once again home to the most interesting mainstream creators, and 2018 has seen some superb comics from the publisher. A large part of this is due to the stellar talent of Tom King. 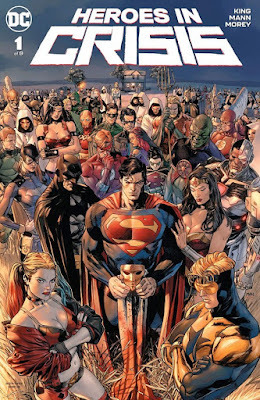 After delivering a magnificent one-two punch in the shape of Batman and Mister Miracle, this week sees the first part of his new event book, Heroes In Crisis. To say I'm excited about this is an understatement, but King has shown that he's great at taking DC's characters and reshaping them for our current day and age, whilst keeping (and acknowledging) their iconic status. I'm also picking up the next issue of Justice League Dark - far better than I expected it to be, with James Tynion IV and Alvaro Martinez Bueno quickly establishing this as a book that's as enjoyable as Scott Snyder's Justice League. Finally from DC, I'm obviously picking up The Terrifics - as one of the UK's leading Jeff Lemire fanboys, it would be remiss of me to miss out! Finally, I'll be getting the second issue of Cold Spots from Image which I'm hoping locks me in for the whole run.